I have had a Pentel brush pen for decades. They come with ink cartridges that are pretty much waterproof when dry and the tip lasts remarkably well. As I have been doing more and more sketching with pen rather than with pencil, I have been using a brush pen more often - as you can see in this sketch done at the Coal Loader in September. This has led me to want to try some others. There are loads of disposable brush pens available but I always prefer refillable pens where possible. Parka did a comprehensive review of a number of disposable and refillable brush pens here with links to individual pen reviews. I am only looking at the refillable Pentel Pocket Brush Pen, the Kuretake No 13 Fountain Brush pen and the Kuretake No 40 and Platinum natural weasel hair brush pens. They are quite different in price and as always you get what you pay for, but the Pentel is a good entry level refillable brush pen. The Pentel costs US$13.50 at Jetpens.com. It is also available from Kinokuniya in many cities. It is a synthetic hair tip, with a pretty fine point. You can also lay down some hefty broad strokes. That's what I used for the sketch above. The Kuretake No 13 Fountain Brush Pen is available in a black or red body for US$28 from Jetpens. 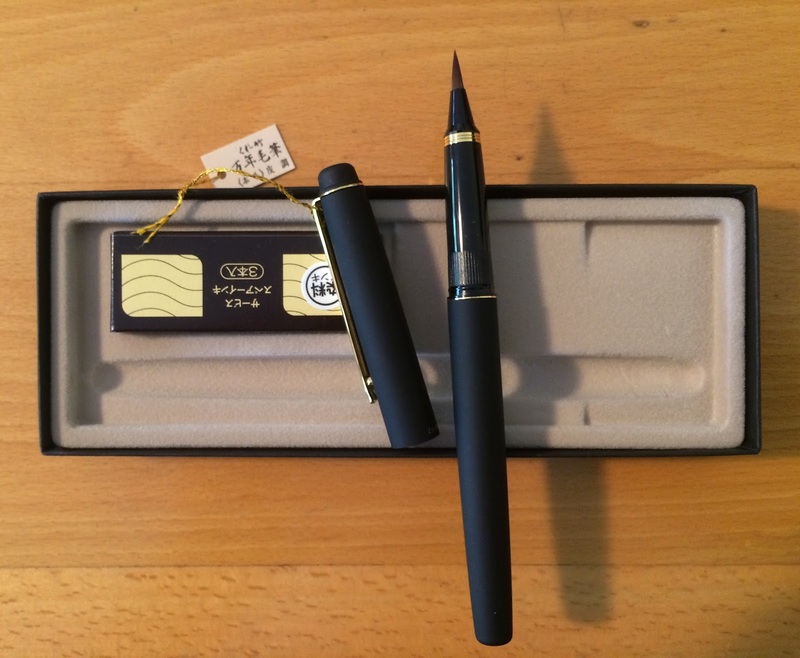 It is a little more expensive than the Pentel and a little more 'classy' to look at. The brush nib is also finer so it creates a lovely delicate line. The Platinum natural weasel hair brush pen is available from Goulet pens for US$64. Since it is a Platinum pen, I have loaded it up with Platinum Carbon Ink in a cartridge and so far it is flowing very nicely. It comes in a presentation box, and interestingly is fitted with a cartridge with a clear fluid in it when it arrives, I suppose so the hair doesn't dry out in storage. Platinum Natural Weasel brush pen. It's tip is exquisite. 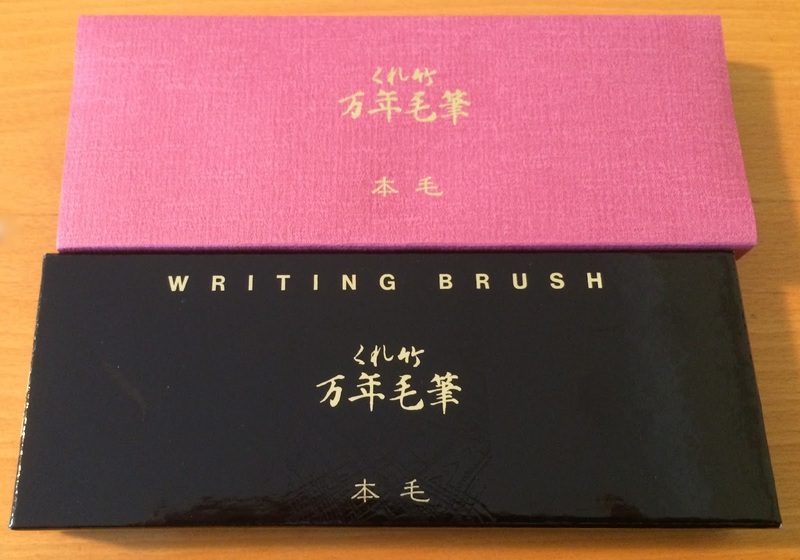 It is finer in diameter than the Pentel or Kuretake pens, and will make the most gorgeous delicate lines. It looks heavier than it is - it is 18gms, just a little more than a Lamy Joy pen, but the kuretake No 13 is only 11gms. The only disconcerting aspect is that while the cap does close snugly, it doesn't 'click' or screw into place. It is available in black, blue or red marbled colours. If you are interested in genuine hair brushes without quite such a hefty price tag, there are also Kuretake sable hair fountain brush pens available from Jetpens for US$36 for the No 40 and US$46 for the fancier looking No 50. This is the #40 version and is 16gms. The tip is very similar to the Kuretake No 13 above and a little wider in diameter than the delicate Platinum. The cap posts firmly and closes with a satisfying 'click'. It has a dull finish with a nice feel in the hand. Much as I love the fine Platinum brush tip, based on price, weight and closure, this is the natural weasel brush pen I would recommend, though I have not tried it with either the Platinum Carbon ink or De Atramentis ink. If anyone has, I would welcome your feedback :-) The ink that is supplied with it is not waterproof. I haven't tested the De Atramentis inks that I like so much in any of these brush pens - I don't know if it might be too hard on the hairs. Hopefully the carbon ink will be fine. I intend to try a water-soluble brown or grey ink in the Kuretake pen once I use up the black ink cartridge that came with it. Thanks for that Larry. I love natural hair brushes but the #13 is a great product :-) Good to know you've had no problems with the Carbon ink. It's been working beautifully in my weasel brush. The Kuretake have refill brush tips also if they get worn out. I've not seen synthetic replacement bristles. Anyway, it might not be too different in cost to replace the whole brush pen. Yes, they have replacements for both the synthetic and the weasel. I have both bookmarked on amazon. I use the Platinum converter with Noodler's Lexington gray ink in my Kuretake brush pen and love it! Great for lighter shadows in combination with the Pentel Pocketbrush pen, especially on toned papers. Thank you so much.your blog is very helpful.Could you please post any material on Web services testing too.